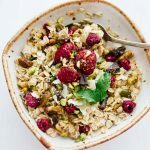 A delicious and simple homemade muesli recipe made with chocolate chips, dried raspberries and pistachios. It’s full of flavor and energy to give you the best start to the day! Chocolate in muesli??? What is even happening right now?! We’re celebrating Friday the right way with Homemade Chocolate Raspberry Muesli! Confession: I’ve been obsessed with muesli lately. It’s so light and creamy, perfect for summer! If you’ve never had muesli, it’s the original cereal. Very similar to oatmeal, but not as mushy. My first time to have muesli was actually pretty recently at the Pinch Of Yum workshop! We had this amazing Seven Sundays Muesli to practice taking photos of and of course taste test, and it was an instant love! So good. Side note: If you’re a food blogger, you MUST check out Food Blogger Pro and the workshop! It’s life changing. 😉 And if you’re not a food blogger (or also if you are), you must try out this delicious Homemade Chocolate Raspberry Muesli recipe….because it’s also life changing! Here’s the deal with this muesli: It’s almost too good and too easy not to make. Want to talk about the easiest and quickest breakfast ever made? Ok, maybe besides the Oatmeal Cookie Overnight Oats, which is right up there with this homemade muesli. You can make a massive batch of this stuff in about 10 minutes, throw it all in a freezer bag, and have it in your pantry or fridge for a couple of weeks. Easy and delicious Homemade Chocolate Raspberry Muesli cereal in 3…2…1. Homemade muesli is extremely healthy and is a great way to start the day. You can pick and choose what you put in it meaning there no nasty preservatives or artificial ingredients, you know exactly what you’re eating. You can pack the muesli full of nuts, seeds, dried fruits, and berries so there’s the opportunity to pack a lot of vitamins and antioxidants in there. Also, try adding different spices such as cinnamon for a festive feel! Pour a little bit of milk over it, let it soak, and add your fave toppings. Done. Healthy breakfasts shouldn’t be complicated! Oh and…CHOCOLATE. I mean, C’mon! Creamy, wholesome oats, crunchy pistachios, sweet raspberries, and heavenly dark chocolate. YAAAAS! You can store the muesli in freezer bags until you need it, it will keep in a cool dry place for weeks. Serve with milk (dairy or nut milk), yogurt or use to top desserts such as fruit or ice cream. A delicious and simple homemade muesli recipe made with chocolate chips, dried raspberries and pistachios. It's full of flavor and energy to give you the best start to the day! Mix everything together in a large bowl and pour into a freezer bag. When ready to eat, serve in a bowl and pour milk over the muesli, letting it soak for about 10 minutes. Add fruit, nuts, and any other toppings! I’ve not has muesli in so long, can’t wait to make this version it sounds amazing!